As a parent coach, primarily working with parents of teens, I’ve found commonality in the issues parents want to address – especially wanting their kids to obey. NOW! For the past 20 years, I’ve been doing some form of helping parents and I really enjoy it. I love the unique stories and challenges, and equipping families to find new insights and practical tools. I thought I’d heard everything – but one particular coaching session surprised even me! When coaching with intense parents Heather and Steve*, the conversation turned to Steve’s tendency to get easily angered and frequently swear when challenged by his son Zach. It’s what Steve had learned in his home growing up. As soon as Zach’s behavior began to feel out of control, Steve would dominate, intimidate, and swear until Zach complied. Now that his little boy was equal height, close to equal weight and learning the same pattern, their relationship was deteriorating rapidly. When parents are desperate, it’s natural to make big goals for change and then fail to meet those goals. The disappointment of that failure then tends to drive more anger. My focus is to identify ways to help parents find smaller, more achievable goals on their way to bigger change. When parents get out of control as they react to their kids, that means the kids are in control and leading the parents. Breaking free of patterns and cycles so parents can lead with calm confidence is tough work! But it is not impossible. What is one small change that would build a sense of progress and momentum for you? Can you work on speaking in a more calm voice? Sitting down and taking a deep breath instead of crossing your arms and standing over your child? For Steve it might have been relaxing his tone, or eliminating one particular inflammatory word he often used. When God commanded the Israelites to take over the land He didn’t tell them to take on more than they could handle. He told them it would be slow, and take many little steps, to accomplish His purpose: “Little by little I will drive [your enemies] out before you, until you have increased enough to take possession of the land.” Exodus 23:30. Little by little. It’s a good plan. Make it your plan. What’s your next baby step of progress? Write it down, and keep it in view. You’ll be much more likely to make that small change and have something to launch you to the next small change. 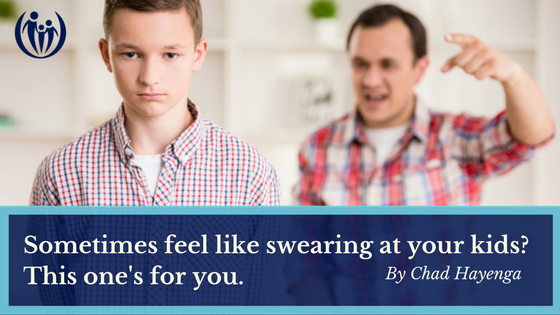 No, I’m not recommending swearing at your kids. I am suggesting that if you want your kids to calm down and have a rational conversation when things get tense, you are the best person to model that for them. You can’t control your child’s emotions, but you can control yours. It takes two to dance – lead them wisely. If it’s helpful, you can even download our Connected Families Serenity Prayer to post somewhere to encourage you in your parenting journey. If you keep getting stuck in the same parenting rut, let us know. We coach parents every day and would be honored to help you!